Good morning, everyone! For those of you that were caught in the snowstorm that affected about half of the country over the weekend, here is hoping you rode it out safe and sound! 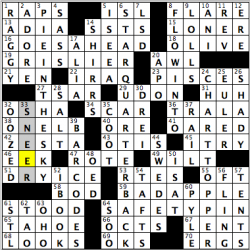 Today’s crossword puzzle theme is all contained in the longest down entries, as four of those multiple-word answers that are “topped” by a word that also can come before the word “chart.” The fifth theme entry, CHART TOPPER, acts as the theme’s reveal (24D: [#1 on the Billboard Hot 100 (and a hint to the puzzle theme in four vertical answers)]). PIE IN THE SKY (3D: [Illusory promise) – Pie chart. STAR QUARTERBACK (6D: [Russell Wilson or Tom Brady, e.g.]) – Star chart. FLOW INTO (8D: [Feed, as a lake]) – Flow chart. BAR CODES (39D: [Scanners read them]) – Bar chart. “Sports will make you smarter” moment of the day: ADIA (13A: [Sarah McLachlan hit with the lyric “we are born innocent”]) – One-time WNBA champion Adia Barnes is currently in her third season as the head coach of the women’s basketball team at her alma mater, the University of Arizona. While a player in Tucson, Barnes was one of the most productive players in the Pac-10, winning the Pac-10 Player of the Year Award in her senior year in 1997-98. Barnes, who ended her Arizona career as the school’s all-time leading scorer (2,237 points), played over 10 seasons professionally, including being an integral member of the Seattle Storm’s 2004 WNBA championship run. Thank you so much for the time and attention once again! Have a wonderful day, everyone, and, as always, keep solving!! 20A: CAN YOU DIG THAT [“Understand, undertaker?”] – I’ve only ever heard this as, “Can you dig it?” It feels like the constructor needed symmetry and modified this phrase to get it to be the correct number of letters. Occupation wordplay! Each of the four themers plays at the occupation being questioned: undertakers DIG, snow plowers work with snow DRIFTs, statisticians work with MEANs, and movie moguls work with PICTUREs. It’s not the most symmetrical set of themers, since undertakers don’t work with DIGs while all the other theme occupations work with their puns, but other than that I enjoyed the theme set. – For [St. Teresa’s home], I plunked in INDIA instead of AVILA. I’d never heard of the correct answer, so now I know! I can see some folks getting caught at the OVID / AVILA crossing. – I really liked the ATOZ / EAZY E crossing – that’s a fair way of getting solvers to spell EAZY E‘s name correctly without having to guess at the Z vs. S.
– I gave a bit of side eye to SAML [Adams (Declaration of Independence signature)]. Hmmmm. – I almost Naticked in the south at ANDRE / EDDA / PERT. Does PERT really mean [Sassy]? This really just means I need to start watching “Brooklyn Nine-Nine”! – More new things to learn: OZMA is a [Princess in Baum books] that I’d never heard about before. According to Wikipedia, she is the rightful ruler of Oz who conveniently appears in all the Oz books except for the most famous one. – I loved the odd string of vowels in DEA AGENT. When I had _EAA_E__, I was sure something was wrong! – The chemist in me takes issue with AERATE being defined by [Add fizz to]. Bubbling air though water doesn’t make it fizzy. Bubbling carbon dioxide or nitrogen gas, however, does. It’s a two-fer-Tuesday! Sam’s got the WSJ and NYT puzzles, both with themes of synonymous phrases. The WSJ theme uses an occupational vibe to differentiate the saying there, whereas the NYT theme is simply [Welcome comment(s) at a bar]. “IT’S MY TREAT!” “DRINKS ON ME,” which feels lacking without “are” in there. “I’LL GET THE BILL,” which feels a bit less like a thing people say. And the two-part “YOUR MONEY’S / NO GOOD HERE.” I’m partial to the first and last lines, and I’m apt to use them at restaurants rather than bars. Good fill: “ANY LUCK?”, NOODGES, WIZARD HAT, an “IT” COUPLE (I bet there are I.T. departments that have employees who are in a relationship! ), IN STYLE, HATE MAIL. 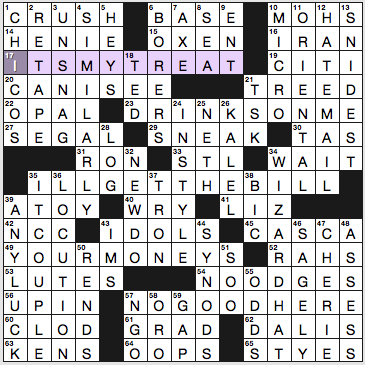 Least savory clue: 21a. [Cornered, as during a fox hunt] for TREED. Why on earth would you want to present a neutral clue about such a brutal (and widely banned) “pastime”? If you think the clue’s fine, please read this page. It’s not as if there aren’t other cluing approaches for TREED. I’ve got an early day tomorrow, so I’ll sign off here. 3.6 stars from me. I have seen only Black Panther of this list, although I have seen a tiny bit of Sorry to Bother You. I think the latter is streaming on HBO. I would like to see the other two, but in due time. Like when they are on Netflix! Yes, I am turning into a cantankerous old man in that I don’t want to go to the movie theater! I will turn 50 this year. Yikes!! A solid 4.5 for this week’s Jonesin’ puzzle. 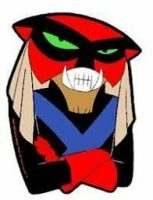 1A [“Space Ghost Coast to Coast” character with a spinoff series] BRAK – The obscure-pop-culture-reference-of-the-week is right off the bat. I remember this character from many, many moons ago! 21A [“__ dead, Jim” (“Star Trek” line)] HE’S – I had to ask my Trekkie spouse about this one: I think this is from the movie where Spock dies. Don’t quote me/us! 54A [ __ Reid (The Green Hornet’s true identity)] BRITT – I thought this was going to be my son Brett’s name for a second. I used to watch the TV show that was similar to the Batman series years ago. I don’t think I ever saw the full-length movie with Seth Rogen. Nor do I have plans to! 2D [“The Amazing __”] RACE – This show is very binge-worthy. Like a seasoned millennial, I don’t like waiting each week! 11D [Pasta __ (boxed dinner)] RONI – Very similar to Rice-A-Roni. Only with pasta. Now I am hungry. 49D [K-Cup maker] KEURIG – I was against these for years, because it is not enough coffee! But there is one at work, and I use it all the time. There are only about 5-6 people where I work in the office at any one time, and not all drink coffee, so it makes “just enough” each time! 52D [“Birdman” actress Watts] NAOMI – I need to see this movie. Didn’t it win a Best Picture Oscar?? 55D [“Bohemian Rhapsody” star Malek] RAMI – I DO want to see this. I think you can rent it now! So yes, after another look-see, I am in fact familiar with the phrases spell check, rain check, sound check and blank check. Very nice! I haven’t played chess in a while; I always feel like I should take it up when I retire and have time to devote to it. Matt Gaffney, Joon Pahk: any tips for chess beginners? The puzzle was not too hard, either, so a fine Tuesday puzzle. It certainly doesn’t seem to “Tuez!” 4.2 stars. 16A [Muslim religion] ISLAM – Is this still the religion with the most adherents in the world? 32A [Jot down] NOTATE – Doesn’t ANNOTATE mean the same thing? Sort of like FLAMMABLE and INFLAMMABLE mean the same thing? 3D [Color-altering camera lens setting] FILTER – I still want a nice camera. I just now recently learned that REALLY nice ones cost $3,000 – $5,000! I will start with something in the $500 range for now! 6D [Paris corp.] CIE. – I think this is like Inc. in the US or Ltd. in England. 8D [Prepare to shine in a bodybuilding contest] OIL UP – Nope. Never doing this. For more reasons than just I have no muscles! 38D [More formal “Me neither!”] “NOR I!” – I think I like this clue better than [Japanese seaweed]. Perhaps there will be someone famous with this first name someday! 45D [Surround] ENFOLD – This seems archaic to me, but perhaps because it isn’t used much. I would say “engulf” instead. I think. This entry was posted in Daily Puzzles and tagged Elizabeth C. Gorski, Gary Larson, Matt Jones, Samuel A. Donaldson. Bookmark the permalink. 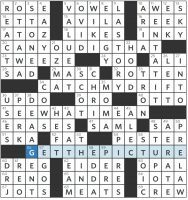 The links to the individual blogs of the Tuesday puzzles go to the individual Monday blogs! Oops!! That’s on me. Just corrected it and, hopefully, things are on the level now! 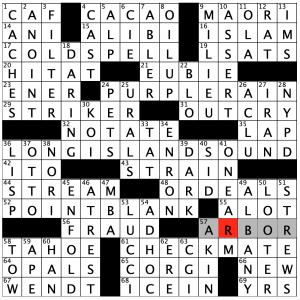 Just did the NYT and Crossword Nation back-to-back, so I noticed that both have STL, which is not unusual – and both have SOO Locks, which is a little rarer. 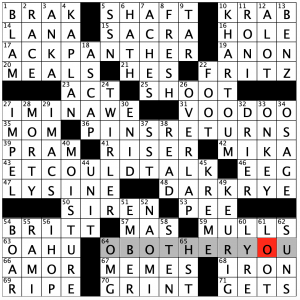 The Great Crossword Conspiracy strikes again! OPAL appears in the NYT, WSJ, and LAT… But I have not yet seen an OREO. OTTO (Preminger!) WSJ and LAT!!! IMS in both NYT and LAT. As well as OPAL(S) as already noted. I’m against them because they’re ecologically wasteful. However, I concede that in certain contexts—including the one Derek describes—they can make sense. There are ways to make the technology more environmentally sound (reusable and recyclable elements, reduced packaging, etc). And indeed, reusable K-Cup filters are readily available. In addition to the environmental benefits, you can use better coffee grounds and save money. They are available, but are to my (admittedly unresearched) knowledge, a minuscule share of the market. Also—and I don’t know if this is still in effect—Keurig implemented technology that prevented reusable/non-Keurig-approved cups from being used in their machines. I finished but still haven’t gotten around to figuring out how! The “He’s dead, Jim” line was used often in the original Star Trek series. Google the line and a YouTube video of McCoy saying this, or a variation of it (sometimes it’s “Captain” instead of Jim and sometimes a “she” passed away), over and over comes up. It’s kind of funny to watch them all strung together.